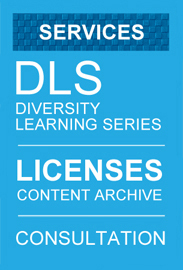 Your use of Cultural Diversity at Work Archive housed on DiversityCentral.com is subject to the conditions and qualifications described below. Your clicking in the I agree box on the Individual and Group Content License order forms means that you agree to accept the following conditions and qualifications. The information, documents, and materials of the Cultural Diversity at Work Archive ("the content") are subject to change without notice. With the exception of any public domain materials that may be incorporated into this site, all contents including text, graphics, icons, and the overall appearance of this site are the exclusive property of The GilDeane Group, Inc. of Seattle, Washington ("GilDeane"). GilDeane reserves all copyright, trademark and other intellectual property rights. This site is protected as both individual works and as a compilation. GilDeane permits you to view, print, and copy documents from Cultural Diversity at Work Archive solely for your personal, noncommercial, and informational purposes. You may not resell, republish, retransmit or make multiple copies of any portion of this site or the contents without the prior written consent of GilDeane. You may not modify any of the documents or remove any copyright, trademark or other proprietary notices. If it does not appear already, you must place the following copyright notice in each document: "© 2012 The GilDeane Group, Inc. All rights reserved." You acknowledge that any submission you make to Cultural Diversity at Work Archive may be rejected, edited, removed, modified, or published online as is by the GilDeane editors. GilDeane expressly disclaims any obligations to keep this site free of viruses or to maintain uninterrupted access. Although GilDeane will use its best efforts to ensure the accuracy of the information contained in this site, each user is required to use professional judgment when using the contents of this site and take responsibility for it. GilDeane assumes no responsibility for any errors or omissions in the contents of this site, including contents that are referenced by or linked to third party websites. GilDeane does not make, and no vendor, distributor or user receives, any warranty whatsoever with respect to either the contents or such use, and particularly no warranty of fitness for a particular purpose or suitability. You hereby indemnify, defend, and hold harmless GilDeane and all officers, directors, owners, agents, information providers, and others connected with GilDeane ("Indemnified Parties") from and against any and all liability and costs, including, without limitation, reasonable attorneys fees, incurred by the Indemnified Parties in connection with any claim arising out of any breach by you or any user of your account of this Agreement or the foregoing representations, warranties, and covenants. You shall cooperate as fully as reasonably required in the defense of any such claim. GilDeane reserves the right, at its own expense, to assume the exclusive defense and control of any matter subject to indemnification by you. As part of the registration process you will give GilDeane certain registration information, all of which must be accurate and updated. Your User ID and Password (your Logiin) will be issued automatically when you sign up as an Individual or Group Content Licensee. As a Licensee you must agree to the terms and conditions of this User Agreement by clicking in the I agree box. Your Login entitles you to an Individual Content License or as a member of a Group Content License to Cultural Diversity at Work Archive. The following registration requirement must be observed: You may not share, transfer, or give out your Login information to any other person; your License is for your private, individual use only. If you are interested in providing access to the site for co-workers, colleagues, executives, managers or employees, then you must buy and arrange a Group Content License for 15 people or a Site Content License for more than 15 people. If you are interested, you may arrange a Trial License to investigate the Archive for a few days. Please see the Content License options for cost-effective group rates. Failure to comply with the terms of this paragraph shall constitute a breach of this Agreement and may lead to the termination of your license. You are responsible for maintaining the confidentiality of your Login for your Individual or Group License. You are expected to notify orders@diversitycentral.com of any known or suspected unauthorized use(s) of your License or any loss, theft, or unauthorized disclosure of your Login. You are responsible for all usage or activity on Cultural Diversity at Work Archive. Any fraudulent, abusive, or otherwise illegal activity may be grounds for immediate termination of your License and GilDeane may refer you to appropriate law enforcement agencies. GilDeane reserves the right to charge fees for access to any of its online publications including Cultural Diversity at Work Archive. In no event will you be charged for access to any of these publications, including Cultural Diversity at Work Archive, unless we obtain your prior agreement to pay such charges. GilDeane agrees to give you advance notice of any fee changes or of the application of fees to portions of the site that are now free. You shall pay all fees and charges incurred through your License at the time of registration at the rates in effect for the billing period in which such fees and charges are incurred. You shall pay all applicable taxes relating to the use of our site at the time of your payment. All return checks and returned credit card charges incur a $20 return handling fee. GilDeane reserves the right to communicate with you, the Licensee, including using electronic mail, for the purpose of informing you of changes or additions to the services it provides to you. GilDeane reserves the right to disclose certain information about your usage of the GilDeane site and other demographic type data. GilDeane also reserves the right to share your postal address information with selected advertisers and others connected with the Diversity or Global Diversity fields unless you specifically request otherwise. GilDeane does not sell, rent otherwise disclose Licensees' email addresses. You may terminate your License at any time by communicating with GilDeane at orders@diversitycentral.com or by telephone, 206-362-0336. Upon notification, your access will be suspended within 24 hours. You are responsible for all charges incurred up to the time the License is terminated. Exercising its sole discretion, GilDeane may terminate or suspend your access to all or part of the web site for any reason without limitation, breach, or assignment of this Agreement. This Agreement is made, construed, and enforced in accordance with the laws of Washington State and any action to enforce this agreement shall be brought in the federal or state courts located in Seattle, Washington.